Sentences Paragraphs and Beyond With Integrated Readings. Best GRAMMAR Materials and Practice Book for Reading, Writing, and Speaking. Get GRAMMAR Materials , Tips, Tricks. Practice more and boost your score. 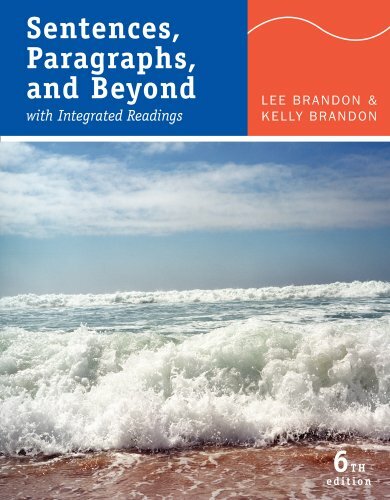 Sentences, Paragraphs, and Beyond is the first in the popular two-level Brandon series. Written in an informal, engaging tone, this easy-to-use text incorporates sentence-level grammar and mechanics with in-depth instruction in the writing process and patterns of writing. Reading instruction offers students the opportunity to analyze readings and practice the reading-based writing required in academic environments. Students will master common writing patterns while learning to use texts as a springboard for their own writing in the form of summary, reaction, or response. High-interest, distinctive readings are integrated throughout the Sixth Edition for analysis and as models of good writing. Clear, explicit writing prompts support each reading and focus on reading-based, cross-curricular, career-related, and general topics. In addition, the photo/art program promotes critical thinking, lively discussion, and analytical writing. Flexibility of instruction permits instructors to emphasize the paragraph or the essay, or to mix units.